The natural gas industry grew to maturity under a system of strong monopoly power of pipelines and local distribution companies (LDCs) and balkanized markets at wellheads and burnertips. Recent developments in the industry, especially phased deregulation of wellhead prices implemented by the Natural Gas Policy Act of 1978 (NGPA) and competition induced by the gas bubble since 1982, have somewhat reduced pipeline monopoly power in some markets. Considerations of economic efficiency and economic justice now require that competitive forces be strengthened further. The FERC's Order 436 was an attempt to do that. Like other oil-importing countries, the Republic of Korea was surprised by the rapid oil price escalation of the 1970s. Following the lead of the United States, Europe, and Japan, Korea's energy policy in the mid-1970s was based on reducing oil imports by substituting other fuels, installing more efficient oil conversion processes, or doing without. Due in part to the urgency of the situation and in part to a lack of accumulated analytical capability, it was difficult to analyze in depth which alternatives were best, how much they would cost, or to what extent it was in Korea's best interests to bear large economic costs to reduce oil imports. Rather, Korean policymakers implemented a broad-based oil consumption reduction program to mitigate their immediate oil import problem. Recent events in the oil market make it easy to forget the policy problems of dealing with supply interruptions. Realizing that history tends to repeat itself and that crises are not conducive to good decisions, it seems worthwhile, therefore, to examine the problem of efficient pricing in the wake of an oil price shock. Analysis of factors affecting various types of energy demand has been the focus of a large number of studies in the last decade. One common point of agreement is that the demand for any fuel is tied closely to the technical, engineering, and thermodynamic characteristics of the energy-using capital or appliance stock. With memories of the energy crisis fading in the midst of an oil glut, one can reflect with objectivity on events of the past two decades. 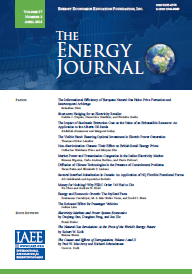 Many papers published in the past several years have attempted to analyze post-embargo energy trends and made observations on whether these new trends represent abberations in long-term relationships or represent fundamental changes in energy-economic interactions. Natural gas prices in Australia have evolved from long-term contracts negotiated when energy prices were considerably lower than they are today.' Following the increases in the world price of oil and the Australian government's policy to price new indigenous oil supplies at the world parity price, it seemed that natural gas was being undervalued. A vigorous debate ensued. One side maintained that gas should also be priced on the domestic market to reflect the value of LNG in the world market. A similar view asserted that gas ought to be priced at the energy-equivalent value of crude oil. This paper assesses the impact of biomass availability on the selection of optimal energy systems, allocation of energy to various energy needs, and cost of energy to villages. Proposals are considered for the development of biomass resources and subsidization of biomass-based energy systems. The analysis applies the Mixed Integer Linear Programming (MILP) optimization model to four villages under existing conditions, as well as under various proposals affecting biomass availability and costs of energy systems using biomass. It is based on a comprehensive study (Moulik and Shukla, 1985) that contains many details beyond the scope of this paper. Following the seminal work of McFadden. Puig, and Kirschner (1977) and the general availability of national microdata sets, residential energy demand studies have been conducted for electricity, natural gas, fuel oil. LP gas, and wood (see Garbacz, 1984, 1985). Using the National Interim Energy Consumption Survey (NIECS) data, Garbacz (1984) developed a three-equation model (demand, price, and appliance stock) to estimate national electricity demand using two-stage least squares (2SLS) for house-holds by month. This study builds on the previous work to estimate elasticities by month and by region. It is hypothesized that elasticities vary substantially between the heating and cooling seasons. Previous work by Acton, Mitchell, and Sohiberg (1980); Parti and Parti (1980); Archibald, Finifter, and Moody (1982); Murray et al. (1978); and Garbacz (1984) supports this. Houthakker (1980), Halvorsen (1978), and Murray et al. (1978) also have found differences in elasticities by region. Demand charges account for one-third to one-half of industrial and commercial electricity bills, and yet they have been virtually ignored, both theoretically and practically, as a component of residential tariffs. Our objective here is twofold: (1) to model and test the effects of a time-of-use demand charge on residential consumer behavior and (2) to evaluate, theoretically and empirically, its influence on utility system peak. Among the pragmatic issues are the effects of sustained hot weather on household response and the effects of the charge on demand at time of system peak compared to billing demand. Although electricity demand receives much attention in the empiri-cal literature (see Taylor (1975) and EPRI (1982b) for excellent surveys on the topic), hourly load demand analysis has only recently begun. Notable contributions are a series of studies sponsored by the Electric Power Research Institute (EPRI (1977. 1979a, 1979b, 1981a, 19816. 1982a) and Platt (1983)). These studies estimate load curve models for regions of the United States. Unfortunately, from a utility perspective, the empirical results presented in these studies are not directly applicable. Further, because the data used in these studies are not generally available at the geographic level of a utility service area, applying their methodology is problematic. This paper presents a practical method for an electric utility to produce an hourly load curve model similar in overall framework to these studies. Our procedure is innovative in that it produces statistically efficient estimates, which the above papers do not. We also demonstrate a method that uses supplementary forecasts to enhance the forecasting performance of the hourly load model. Oil and energy use in developing countries has undergone a significant evolution in the past several years. For nearly all oil-importing developing countries (OIDCs), the two sharp oil price increases in 1973-1974 and 1978-1979 brought a large rise in import bills. With the 1973-1974 price rise, there is some indication that short-run impacts on the external economy were handled without major disruption (Dunkerley and Steinfeld, 1980). The second oil price increase, combined with worldwide recession and the diminishing world trade, caused economic growth to stagnate far more than did the first price increase (tiara, 1984). Increasing attention has been given in recent years to the valuation of reliability in the supply of electricity. It is peculiar in the use of the terms that the value of reliability is equivalent to the cost of unreliability. In attempting to identify and measure this cost, researchers have drawn a distinction between different types of cost, particularly short- and long-term costs. In this paper, we examine this distinction to clarify what may be a source of confusion.